New Corral Girl's A2773 Western Boot Brown/Beige Embroidery 5 by CORRAL at Blood of The Young. Hurry! Limited time offer. Offer valid only while supplies last. 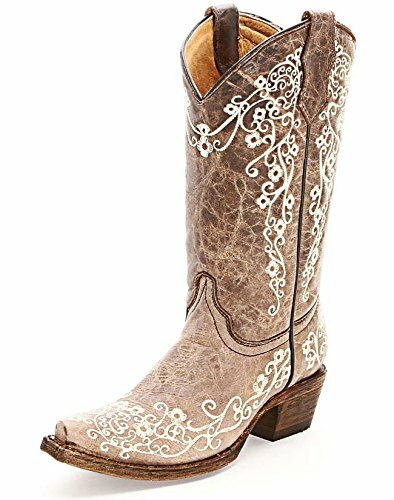 Dark brown distressed leather boots decorated with whimsical floral embroidery etched in cream-colored thread. 10'' Top. Snip toe. Riding heel. Dark brown distressed leather boots decorated with whimsical floral embroidery etched in cream-colored thread. 10" Top. Snip toe. Riding heel. Leather upper/Leather sole. If you have any questions about this product by CORRAL, contact us by completing and submitting the form below. If you are looking for a specif part number, please include it with your message.